A rapid assessment by scientists of the ongoing heatwave across northern Europe this summer has found that human-caused climate change made it as much as five times more likely to have occurred. The preliminary analysis, by a team of scientists at the World Weather Attribution network, uses data from seven weather stations in Ireland, the Netherlands, Denmark, Sweden, Norway and Finland. The team were not able to get sufficient data at short notice to include a UK station. The findings suggest that rising global temperatures have increased the likelihood of such hot temperatures by five times in Denmark, three times in the Netherlands and two times in Ireland. The sizeable year-to-year fluctuations in summer weather in Scandinavia makes it harder to pin down a specific change in likelihood for the heatwaves in Norway, Sweden and Finland, the researchers say. 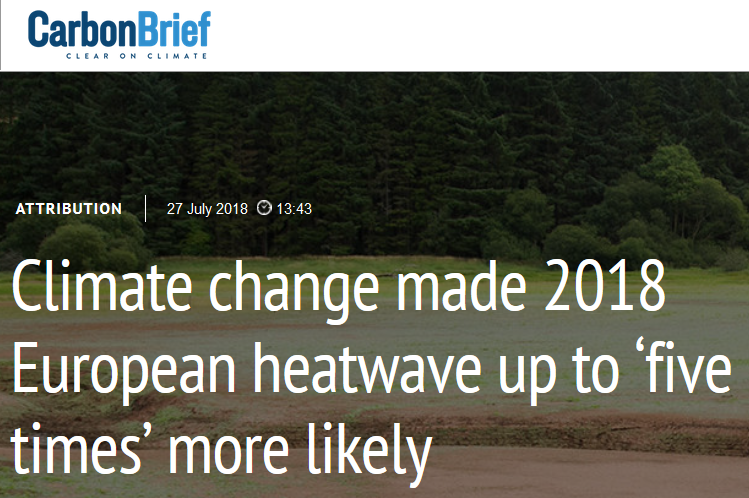 However, “we can state that, yes, heatwaves have increased – and are increasing – in Scandinavia as in the rest of Europe”, says one of the scientists involved. The summer of 2018 has been remarkable in northern Europe. A very persistent high-pressure anomaly over Scandinavia caused high temperature anomalies and drought there from May to (at least) July. Southern Europe was unusually wet, with damaging thunderstorms in France in the first half of June. 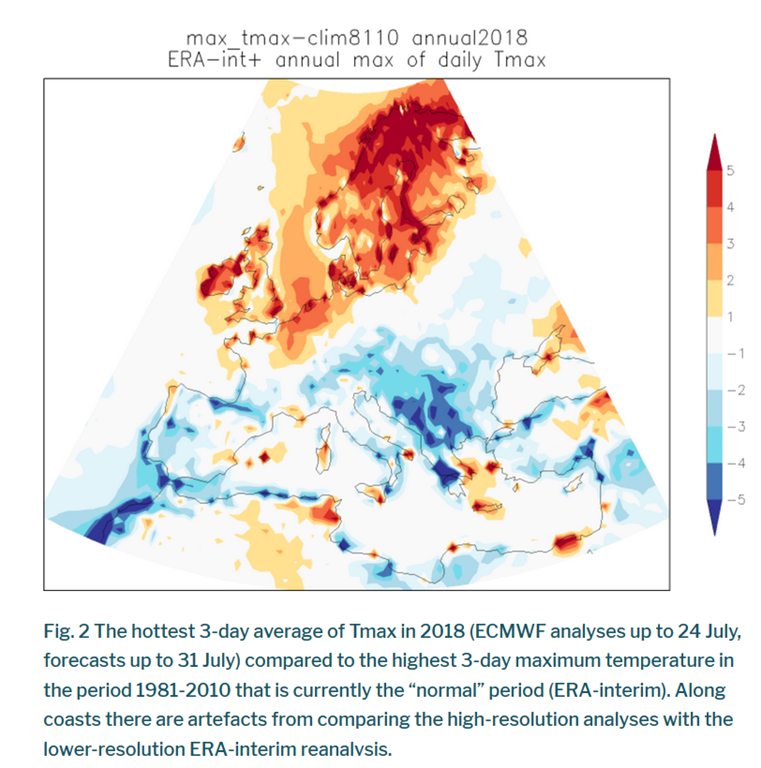 In this analysis we investigate the connection between one aspect, the highest temperatures so far in Northern Europe, and climate change…. As we can see, the hottest days were actually cooler than average in southern Europe. But what about the north, particularly northern Scandinavia? Talk of the Scandinavian heatwave has been widespread this summer, with temperature of 32C close to the Arctic Circle in Sweden, Finland and Norway. To the general public, such temperatures must seem incredible, simply out of this world. But, as we shall see, they are not. As we can see, temperatures of 30C and more are not uncommon in these high latitude sites in Finland. Sodankyla, which is the most northerly, and at 67N inside the Arctic Circle, peaked at 32.1C this summer. While this is a record, KNMI tell us that temperatures reached 31.7C in 1914, and 31.5C in 1934. Maybe heatwaves are half a degree hotter these days than a century ago, but the idea that AGW is making the Arctic burn up is fraudulent nonsense. This is utter drivel. The idea you can differentiate between the Netherlands and Denmark in such a study just shows that they are playing with numbers, not doing real statistics or analysis. It is frankly absurd to believe that you can work out how likely a heatwave in Europe is with and without additional CO2. There must be billions (at least) of unique combinations of weather that could be had – these studies just make groups of those billions of unique events and claim they are the same, when they are fundamentally not. It is like have a twenty sided dice and saying that in fact there are only five number – 1-4, 5-10, 11-15 and 16-20. Phoenix, I agree, but this – “The findings suggest that rising global temperatures have increased the likelihood of such hot temperatures by five times…. ” – did at least give me a good laugh! And why do they state that equivalent UK temperatures “where not available at short notice” ? Why short notice? why couldn’t they have waited for them? Because they were in a hurry, George. Leave it too long and people will have forgotten what a good summer they had had once the September chills kick in. Memory is not what it used to be. John Humphrys had completely forgotten last winter’s snows on the BBC R4 ‘TODAY’ Programme recently. To make the most of a ‘Fear the Future’ moment the WWAN (what an unfortunate acronym!) had to strike while the iron is hot (pun sort of intended, so make the most of it) and help to spin the new ‘Hothouse Future’ thing. Comments on ‘Weather Channel’ Thread on this site appropriately & helpfully refer. The news cycle & Depts of broadcasters (esp. at the BBC) have appallingly bad and notoriously short memories. Heatwaves in sub-Arctic regions occur most years – always have. I visited central Alaska in July 2016 and found temperatures over 30C for several days. Fairbanks – Alaska’s second city – is only 150 miles or so from the Arctic circle yet rarely fails to exceed 30C in July, and I believe the maximum temperature ever recorded there (100 years or so ago – what were “carbon emissions” then?) was 99F – pretty much on a par with England. So, cutting through the hysteria, no great surprise in the 2018 summer stats for Northern Europe. As Paul points out, there is a real problem of perception here. Whatever the quality of the World Weather Attribution Network report, the highlighting in the media of temperatures of over 30 Celsius in the Arctic, where surely everyone knows that it is cold all year round, is likely to reinforce the general conviction that “climate change is real and it’s happening now”. 1940, but this is positively balmy compared to stations further east. Vorkuta near the western base of Russia’s Yamal Peninsula at 67 degrees 3′ north has a record of 33.8 Celsius and Khatanga near the eastern base of the Taymyr Peninsula at 71 degrees 58′ north has recorded 36.7 Celsius – clearly the Brogdale of Siberia! I wonder if they will use the same argument this winter when it gets so cold that the Baltic Sea freezes. The Baltic Sea freezes every winter. They actually have ice roads that go out to some of the islands during the winter. Why don’t these people put their names to it instead of authoring such a statement as “scientists” ? In the UK the likelihood of ‘hot’ days increased in the (also) natural early 20th century warming period, according to CET daily maximum data set. Up to five times? That means from zero to five. Just like automobile mileage? Up to X per mile or per km?? Or headache relief… up to X hours. Meaningless rapid assessment… but a headache anyhow? carbon briefs, but no knickers and no control. I rate it ‘carbon brief’ with septic pscience, the graun and the UNIPCC all are advocates of the boxxocks of man made warming. Musing on, .no doubt mrs maybot is an avid reader of all the above – claire ‘vacant’ perry will be and that’s just such a depressing thought..
As I suggested before, the WWA network is just the embodiment of the proposed Obama era ‘climate SWAT team’, just another part of the enormous CAGW propaganda machine. Just regard any output as junk science to be filed in the bin, and you won’t go far wrong. I’ve just come from a wake where the eulogy was given by an Oxford Don(?). At the afters I was sitting at his table and we were all discussing ideal places to live. NZ came pretty much top, with Oz second. Oh no, says the Don, pretty soon, Australia will soon become an uninhabited wasteland because of global warming. I couldn’t help myself and challenged him. OK, says he, maybe not in our lifetime. That, says I, defines it as a scam. He didn’t speak to me for the rest of the meal. I guess he wasn’t used to someone questioning his belief structure. https://www.metservice.com/national/home Weather in New Zealand is what weather forecasters delight in. Changeable and varied. All buildings are having to be upgraded as the likelihood of faults failing increases with further study. A Geology professor may like it. Not a good place for peaceful retirement..
Paul, thirty or so years ago I would have trusted reported temperatures but not anymore. You just can’t trust most sources now as many have been infiltrated by political and environmental activists; just look at the MET! Why is Iceland Experiencing the Worst Summer in 100 Years? This summer, the island is having a particularly grey and wet summer. In fact, it is the greyest and wettest summer since 1914. Not only that, but this summer weather was preceded by a month of rain that lasted the entirety of May. It is always the same. Actually look at the data and find they are talking rubbish. “The findings suggest that rising global temperatures have increased the likelihood of such hot temperatures by five times in Denmark, three times in the Netherlands and two times in Ireland.” All the data I see on various blogs and websites indicate that global average temperature (whatever that means) is falling back and has been flat for the last 19 years. How can we stop the repeated fraud and miss information? I think only in court? Preferably the BBC!!! CrowdJustice funding?